How Does The Join the Band Program Work? How does a typical Join the Band® band session work? The Join the Band band program is a year round program. Students perform 3 concerts during the school year and 1 concert in the summer. We also have the bands perform and school and community events. Most perform 3 songs at the concerts. Depending on age and level some bands will perform two songs. Advanced bands can opt for a five song session. Where is the Join the Band music studio? Click here for a map and directions to the studio. What is the age range of “JTB” Band Members? Simply call us at 818-345-8950 To register Click on the “register” link at the top of this page. How many band members are in a band? Most bands have three to five Band Members. For a three-song group we need a minimum of three Band Members, and for a five song band, we need a minimum of four members. Our largest groups have had up to eight Band Members. Do I have to audition to be in the JTB band program? We like to evaluate each new member in person so we can place them in an appropriate playing situation. A variety of factors are involved in placing students in bands. The two primary factors are age and playing level. Kids of the same age however can vary greatly in playing level depending on the student. For example in our experience we find that young drummers (8-11) may play (but not always) at a higher level than guitarist of the same age. This has to do with the physical aspects of learning the instruments. Guitar requires more intricate movement with the fingers and wrist, which can be very hard for a young musician. Drums on the other hand are “easier to learn” because the basic moments are easier for a young student. We have a lot of experience placing students in bands. We have the final say on who plays in any given band. Please respect our judgment. 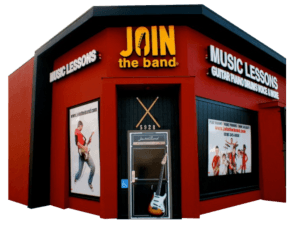 Do you offer private music lessons. Yes, we have teachers in our studio that are available for private instruction. Guitar, Bass, Drums, Vocals, Piano/Keyboards, etc. We also encourage all students to have a private music lesson each week to help supplement their JTB experience. If I have friend that want to join, can we all be in the same band? Yes. Sometimes we often have kids that play together that are already friends. However, it is to be understood beforehand that they may not all be at the same level, and song choice can be more difficult in these situations. Will I stay in the same band after my first session? Some bands stay together from session to session. Some do not. However, the program is not designed to keep kids in the same band all the time. Most students participate in our JTB band program on a recurring basis, but sometimes Band Members may be out for a variety of reasons. We can always find a band situation for you to play in. We do not recommend signing up for a JTB band session if you are going to miss more than three or four rehearsals. Rehearsals cannot be made up. You must make your rehearsal time a commitment to you and your Band Members. Class tuition is not pro-rated if you miss. However, we do accommodate rehearsal conflicts due to a religious holiday observance. Just bring your instrument. All the equipment in our studios is professional quality. We supply the drum set, guitar and bass amplifiers, keyboards, and sound system. All you have to do is walk in and play. How to you work with guitar players? Guitarists in Join the Band share both rhythm and soloing roles. Everyone gets equal time to play. We never designate a “lead guitar” or “rhythm guitar”. We want them to be guitar players. If a student decides they prefer not to solo that is fine. However, we will always give them the chance. We encourage team work and equal time. “Everyone Plays”. How do you work with singers? We treat the voice as a primary instrument. Like a guitar or drummer the voice is the students instrument. Therefore if we have a student that only sings and does not play another instrument they are placed in a band as the dedicated singer. Other students that sing and play another instrument will sing back up vocals. We give everyone a chance to play. If we have multiple singers in a band that play an instrument the lead vocals will be divided up among-st them if there is not a “dedicated” singer. We have a very diverse song list. We ask our members to submit their song requests two weeks before a session begins. If there is a request that is not on our song list, we request three weeks notice to prepare the music. The music needs to be prepared in chart form so the teachers can run the rehearsals efficiently. We spend a lot of time on song selection. We must consider the playing level of every Band Member. Very often students (and parents) request songs that are not good choices for the band to learn in the time allowed. To enhance the growth of our students Join the Band also likes to present a variety music styles including rock, blues, jazz, funk and more.We have a lot of experience in picking out appropriate songs. Please trust our judgment. Keep in mind the following issues are general in nature. We take each band case by case because of all the variables involved. Who is going to sing? A young boys (12-15) voice is going through physical changes that will restrict his vocal range. We can’t ask him to sing songs that are out of his range. Songs by bands such as ACDC, Led Zeppelin, and more feature vocalists that sing in the very high tenor range. Hitting high E and F#’s. A teenage boy simply won’t be able to do that. Just like we wouldn’t expect a young guitarist to be able to play a complex guitar solo note for note.The high vocal range is fine for female singers. The problem is the girls tend to want to sing “pop” music and boys want to rock out. It can be a tricky process. Everyone needs to compromise a bit. Can the band learn the song in the time given? We have to pick out songs that are realistic for the bands and each band member to learn in the time given between concerts. Most students have no idea about the technical issues of a given song and how it may or may not work for an entire band. Something easy for a singer may be very difficult for a drummer. An easy song on drums may be very difficult to sing or perform on guitar. Is the song appropriate? Opinions vary greatly on what is and not appropriate. If you have any concerns please contact us. Does the band have the right instrumentation for a song request? This sounds easy of enough but it is very often overlooked. Students will sometimes pick out songs that do not fit the instrumentation of their band. For example a song that features keyboards and horns may not sound right in a band with only guitar, bass and drums. No, but it does help. All members are given a chart to follow for the rehearsals. Some students read them, some don’t. The readers always learn everything faster. In this day and age of internet tablature a lot of guitar and bass players get “tabs off the internet.” Our experience has been that most of the tablature sites are very poor transcriptions of the songs. How loud do the bands play? We recommend that everyone wear earplugs or sound muffling headphones. Decibel (sound pressure) levels do vary from band to band. The safest bet is to just learn how play with earplugs or headphones. Loud music will damage your hearing. Wear hearing protection. Can I bring my own equipment to the concert? We provide all the equipment for the concert. All the equipment you rehearse with will be at the concert. Guitar and Bass players must use the amps that are provided. We also prefer that drummers use the provided cymbals. Can parents or friends sit in and watch the band rehearsals? We prefer that only Band Members be in the room. It is distracting to the the other groups to have parents or friends in the rehearsal studio. Plus it is easier for the Band Leaders (teachers) to keep everyone focused without the distraction of non members in the studio. If you would like to sit in on a class please ask the teacher first.